As much as I love Valentino strappy rockstud heels all the fashionistas are wearing, they have no place in our Canadian slushy cold winter walkways. That's why over the knee boots are so amazing here! They keep me warm all the way up to my thighs YEAH, aaaaand they have a decent grips for fawncy shoes! I received the Stuart Weitzman Lowlands in black as my special Christmas present this year. 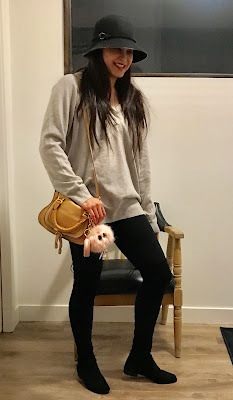 I tried them on previously with my husband and fell in loooooove! 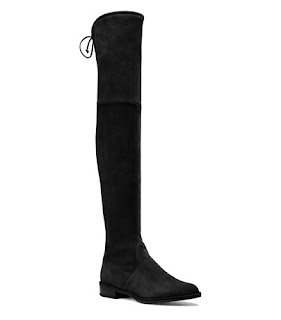 These are the classing black Lowlands by Stuart Weitzman (never seen them on sale). Do not be affraid of these! 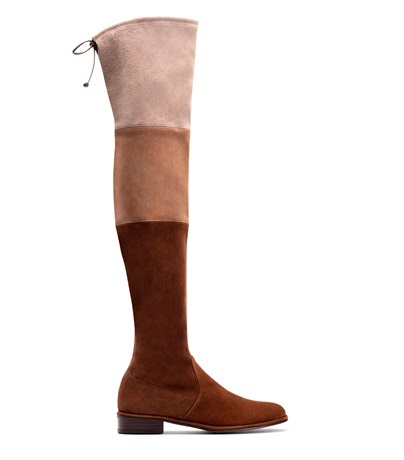 I have wider calves and feet but since they are a stretch suede I had no problem getting them on or off. I am typically a size 8-9 in designer shoes (such as Jimmy Choo's or Christian Louboutins) but I am a true 7.5 in these boots. I have tried other versions of this shoe at Aldo and nothing stays up on my leg like the original Stuart Weitzmans! 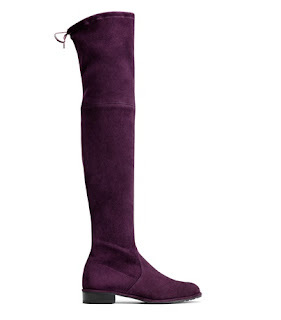 I'm also picky about boots that bunch up around my ankles and these don't. Girls these are worth every penny! Surely I wouldn't show you these shoes without some sale prices! The two pairs below are on sale in some sizes currently on the Stuart Weitzman website! 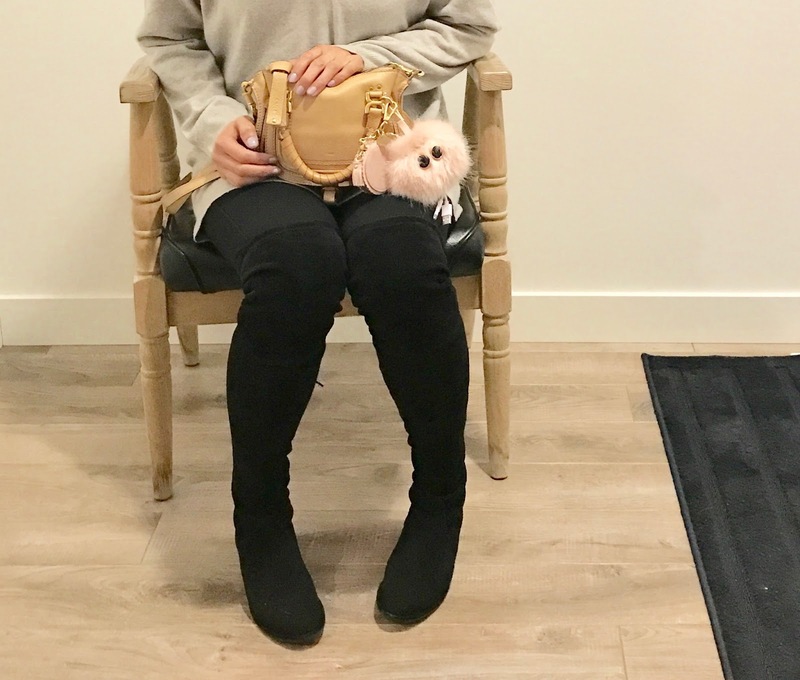 I have been scouring the sites for sales on the Lowlands for months and they are on sale now at the Stuart Weitzman Canadian website in a few colours and sizes. If you like the look of the lowlands there is a style called the Thighscraper that is identical in fit to the lowlands. The thighscraper has a faux zipper going up the calf of the boot instead of the seam and elastic like the lowlands. I prefer the thighscrapers more but Stuart Weitzman Canada was sold out of my size at the time so I got the classic black lowlands instead. They now have stock and sizes of the Thighscrapers on the website now and they are also on sale! Another similar boot to the lowland is the Stuart Weitzman Trio (as in 3 colours). This style is also the exact same fit as the lowland except it has three different nubuck colours. 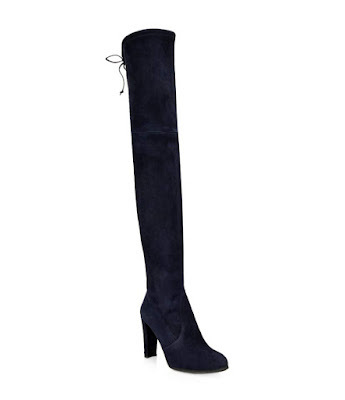 For those of you in search of something with a higher heel, this navy Stuart Weitzman highland pair is on sale right now at the Canadian shoe store Browns and there are a lot of sizes available too!